I recently joined a book club organized by some local homeschooling moms. We had our first meeting this past Saturday, and the fellowship was most enjoyable! Several weeks ago, when one of the club hostesses told me the title of the book that would be discussed, my attention was immediately piqued! 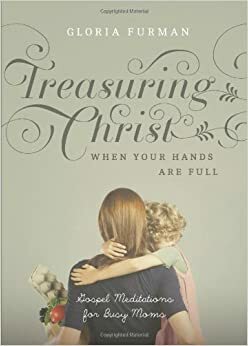 Treasuring Christ When Your Hands Are Full. Yes, yes, yes! That's me! My hands are definitely full, yet I long to treasure Christ more. As soon as I began reading this book, I was blown away by how much Scripture was quoted on just about each page. It was such a refreshing read because every thought, every concept was beautifully interwoven with verse after verse from God's Word. Familiar verses I've read dozens of time came alive in new ways because of being paired with other verses or thoughts from the author as she related them to grace, and specifically, grace in mothering. ~ The importance of confessing my sin to my children when I lose my patience with them and speak unkindly. This is something I should have started doing a long time ago, but for some reason, I tended to justify my wrong reactions to my children's misbehavior because of what they were doing that "provoked" my impatience. Real mature, huh? The author shared something similar from her life, and it convicted me. I have recently tried to be more sensitive to my tone of voice and moments when I don't have the right response and ask forgiveness of my little ones. It's been amazing to see Isaac's little eyes light up when Mommy asks forgiveness, just as I've taught him to do, and how willingly and graciously he is ready to give it. ~ How integral the Gospel is to mothering. It's not just about salvation and a starting place for everything else in my walk with God but about so much more, including mothering. I wish I could elaborate on this point more clearly, but I've tried three times and not found the words. Perhaps some of the below quotes will lend further insight into what I'm trying to say here. ~ How beautiful grace is, and how very much of it God has available for my every day, every need, every moment! I came to a renewed, refreshed understanding of the phrase I've heard so often, "My grace is sufficient for thee." As I understand better and lean more fully on the grace of God, that grace can then pour forth to my children. ~ My need to lean on the Lord completely, trusting in Him for the kindness, the patience, the delight I want to have for my children. He is my unlimited resource for all things that pertain to life and Godliness and victorious mothering! The Gospel stands above and beyond all the most practical, family-friendly, or cost effective philosophies of mothering. When Jesus rescued me from hell, he also rescued me to himself. “Truly alone” time with the Lord is a gift. But so are the times when you’re ring-mastering your family circus. The Lord is just as near to you when you’re using a bulb sucker on a tiny, congested nose and as you’re summoning the wisdom of Solomon to settle a spat over a disputed toy. It is this love - the love of Christ - that compels Christian mothers to love their children. The love of Christ in her heart is what overflows when a mother speaks kindly to her children even when they don’t speak kindly back. A mother’s Spirit-empowered sacrificial love is what enables her to willingly complicate her life for the sake of her children. Consider how the Lord Jesus Christ willingly and cheerfully complicated His life so that He could share His life with us. Although He was in the form of God, He “did not count equality with God a thing to be grasped, but emptied Himself, by taking the form of a servant, being born in the likeness of men. And being found in human form, He humbled Himself by becoming obedient to the point of death, even death on a cross” (Phil. 2:6-8). As if becoming God incarnate wasn’t humbling enough for the Creator, this innocent author of life further humbled himself by allowing himself to be crucified like a criminal. There are times when we are not motivated by the love of Christ, and we fume at our children not because they break God’s law but because they break ours. 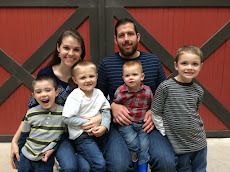 I am so thankful for how the Gospel frees me from seeking glory in my parenting or in my kids. My children, although they probably can’t articulate it yet, are relieved that when I treasure Jesus, they are freed from the burden of being the center of my world. No child should have to shoulder the weight of her mother’s glory and reputation. Every mother can be freed from seeking her own glory as she loves her children for the sake of Jesus’ name being made famous among the nations. Spiritual counsel that has “empty calories” or is devoid of rich, biblical doctrine cannot and will not satisfy a soul that was made to be satisfied only with an infinite God. Motherhood is physically exhausting, emotionally draining work. Where can a mother find the strength she needs to serve her family? From God, who is “able to make all grace abound to you, so that having all sufficiency in all things at all times, you may abound in every good work (2 Cor. 9:8). Even when our back gives out and our body is tired, God can strengthen mothers “with all power, according to His glorious might, for all endurance and patience with joy” (Col. 1:11). Thanksgiving is the proper response to God as He extends to us all the inheritance of grace we have in Christ (Col. 1:12). I remembered that motherhood is not a blessing given to me because I deserve it. It isn’t a reward for my good deeds or (as some might suggest) a sentencing for my bad deeds. God made me a mother because He jealously and rightly desires praise for His own name, and this is how He saw fit to do it. God’s grace is sufficient for everything He has called us to. “And God is able to make all grace abound to you, so that having all sufficiency in all things at all times, you may abound in every good work (2 Cor. 9:8). God makes all grace abound to us through His Son, Jesus. And it’s through the strength of His indwelling Holy Spirit that we are able to abound in (not just drag through) every good work He lays in front of us. And as we work, we work with an eye toward eternity, knowing that our work is not in vain in the Lord. “Therefore, my beloved brothers, be steadfast, immovable, always abounding in the work of the Lord, knowing that in the Lord your labor is not in vain” (1 Cor. 15:58). At the end of every day - chaotic and mundane alike - motherhood is about the adoration and enjoyment of our great God.